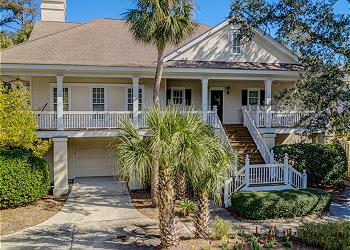 2nd row from the ocean this lovely 4 bedroom, 3.5 bath home with private pool and free standing hot tub is an ideal Hilton Head family get away home! Ground level hosts a spacious deck, decent size pool and free standing hot tub. On the first floor of this fabulous house, you will find the large open living area and updated kitchen with granite countertops, dining room with seating for 8, and a master bedroom with king bedding and en-suite bathroom with expansive walk-in shower and garden tub. Off of the living room is a spacious deck with a gas grill and outdoor seating for eight and two chaise lounges for enjoying the sunset. Upstairs on the second floor is a second king master suite with a shower tub combination . The third bedroom has 2 double beds and shares a bath with the fourth bedroom which is outfitted with 1 set of bunk beds and 1 daybed with a trundle. Only steps to the beach, this family spot should be your new vacation rental home away from home!